Whenn over at Opinion Minions has been way to good to me and gone and given me this Rockin' Girl Blogger Award! She was so sweet and said all these nice things about me that totally made me blush. She even said she liked my template, which is currently the bane of my existence. Sooooo...Whenn, it is you that totally rocks. Thanks for always coming by and leaving comments...you always make my day! You really are to good to me. Thanks! 1. My sister Boo over at Optimistically Waiting is currently in the thick of her in-vitro cycle right now. She is so amazing and so strong. She will make you laugh, but more than that, her blog is touching and real. You should check it out! 2. My cousin Liz over at Moose on the Loose chronicles her family life with my most precious and perfect godson. 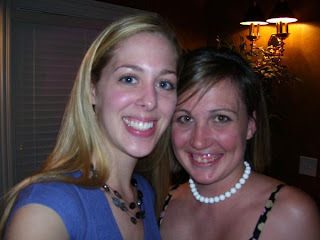 Her blog is full of pictures and family adventures along with funny stories and personal updates. If you like family blogs, you will like hers! 3. My aunt, Mrs. Who, over at I Know Where You Can Find It is am elementary school librarian who posts EVERY WEEKDAY with amazing and insightful stories. She will make you laugh, she will make you cry. She is great. Worth reading...EVERY DAY! 4. My Aunt, Lucy's Mom, over at Musings From the Left Coast is a professor at a University in California. She posts on everything, her past, per present, her random thoughts. Trust me, you will get lost in her stories. You will love them. You will feel like you know her. She is a wonderful writer, and worth going to read. You won't regret it! I was really dreading my trip to the other lab earlier in the week...that was, of course, until I found out that Nick was driving up and we were going to hang out and have dinner at the wonderful Cheesecake Factory with his parents. Once I had all those details in my head I was really kinda pumped! So...wouldn't you just know that after I get all my plans lined up, found out that the hotel does have WiFi, pack my bags and make the hour and a half drive I would find out that there was really no need for me to work more than one day there and that I could go ahead and drive home the same day. Damn. Really, the decision was up to me. I could have still stayed, taken them up on the hotel, then found random things to do around their lab. Things that need to be done, but not that just HAVE to be done RIGHT THIS SECOND. I was tempted. I was there, totally ready to stay. Then my adult self started talking inside my head. "You know you should go back. Your lab has this same kind of work that needs to be done. No real reason to stay..."
Then the child self kicks in, "But it will be fun! Hotel room, great dinner, Nick is coming, a night out...cheesecake!" Adult self yells back, "You wont even sleep that well in the hotel...you know it is true. Your back will hurt. They need you at home ... you have RESPONSIBILITIES!" And then....then an amazing thing happened. The child self gave up. I told them that if they really didn't NEED me, I should go on home. We canceled the hotel room, and I got back into town around eight pm. A long day...with no cheesecake, but it was really nice to be home and I got a hell of a lot done in my lab yesterday. One more sign that I am actually growing up...the adult voice is winning...sometimes. Why is it that when a person is terrified to fly, they will undoubtedly have the worst flying experience ever? Why can't it just be easy? Nick headed off to New York yesterday. The first time they went there was a direct flight, but this time they had a lay-over in Atlanta. This fact alone was horrifying to Nick. He truly hates the idea of being on a plane, so the idea of two in one day just about put him over the edge. I guess it is just fate that when he landed in Atlanta they found out there was a delay on the connecting flight. As they sit there...for several hours...they find out that the problem is that there is some issue with the plane. Really?!?! Do you need to tell my fly-a-phobic (I am sure there is a real name for this) husband that the plane is having mechanical issues?? Do you really think that is what he wants to be picturing in his head? I am sure he thought the wing had fallen off or something and it took all his will power to not just run out the door and jump on a bus back home. After the extended delay they did make it safe and sound to New York. I just hope he is still willing to get on a plane to get back home! Apparently I am totally addicted to my computer. Seriously. I had no idea how bad it was...but I am telling you, it's bad. Nick was working on the addition on Saturday. He was in the process of sawing threw our stone exterior when he noticed a cable line right in his way. There was nothing he could do...he cut it. It was my broadband. I have really not been myself since. I was okay for the first day...It was my little sisters birthday party, we had things going on, no time for the computer anyways. It was Sunday morning that it hit me. There I was, coffee in hand, and no email! We somehow let time get away from us that night, and before we knew it, it was six pm...everything was closed. Monday morning...no email, no blogs, no Myspace, no bank account...I thought I was going to have a panic attack. We went out with the family for Missy's birthday right after work, so there was no fixing it then either. Nick is heading to New York for a week tomorrow and I really think I would have gone to stay with Charing had he not had it fixed before he left. No need. Today after work I got my computer back. Hello my beautiful Internet...oh, how I have missed you! I promise we will never be apart this long again. Now, as a confession...one reason I was wanting my Internet back so bad was that I was waiting on this blog review. I had signed up for it AGES ago, and I knew it was my turn. I was really looking forward to it....I read their reviews and pretty much agree with them, so I was really interested to see what they had to say. They rank you from one to ten. I was hoping for a six....okay, I was hoping for a perfect 10, but I knew I would be happy with a six. Better than average, right?? Well...I didn't get a six. Let me explain before I reveal my score. Apparently, clearly unknown to me, my bubbles are completely retina burning. Damn. Here I was thinking they were all cute and beaker like. They hurt the reviewers eyes so bad she straight up refused to read it. Ouch. So....I am thinking this is not so great. I am a little frustrated that she really didn't read anything I have written, but in her defence she said she would come back and re-review my blog once I have a template that doesn't make her sick. I have been giving all of this some thought and decided to rework to old template. At first I was all like " I LOVE my template...How DARE you!!!" Then I remembered that I signed up for this...and that I usually agree with them. Then Nick looked at it (he is not a reader of the old blog) and said "It's a little loud". Humph. I don't want the way my site looks to take away from people wanting to read it. I REALLY don't want it making people feel seasick. So I am toning it down. Keep an eye out for a new look over then next couple of days! Monday night I was laying on the couch and Nick walked in. The sun was setting and he had been working in the yard. He had picked up a couple of ferns and got them planted in the back after work. He looked over and me and said, *sigh* "I'm done! We have been working so hard on this yard and all of our flower beds and vegetable beds are finished. Now we are totally at maintenance for the rest of the summer. What a great feeling!" He should have known it was too good to last. Yesterday our lovely home town was hit by one hell of a storm. Around noon Nick called me to see if it was hailing at my work. It was hailing at the University and he wanted to check to see if it was also happening by me. I stick my head out in the rain...trying to decide if anything looked like hail, end up sending Tarp out into the pouring rain to check....he comes back with some gravel (oops...my bad) and we decide it must be missing us. Honestly I was a little bummed. How often to do you get to see some hail? Apparently I had to wait about three hours. There was no looking out to see or running to pick up gravel this time. It sounded like our lab was going to cave in. This. Was. Crazy. We are talking quarter sized hail, and a TON of it. Ripping threw trees, bouncing off cars (Lucky for me I still don't own one...) basically taring everything apart. It was honestly like nothing I have ever seen in my entire life. Once it stopped there were huge mounds of it, you could pick it up and make hail balls out of it! Once I got home I realized our house had been hit even harder. It was three hours after the storm and our flower beds still had a couple of inches of hail in them! (Okay, I totally know at this point I should be loading pictures and they would TOTALLY make this post better, but unfortunately I had let Candice use my camera...who knew there would be a freak hail storm that needed documentation?!?!) Our flowers in the front had all the blooms knocked off them, but I think they will survive. The back yard is another story. There is NOTHING left. Our flowers are totally gone. You can't even tell they were ever there. Same with the vegetables. Our Hostas looks like a very creepy plant skeleton. Only the stems...no leaves. Nick was seriously broken hearted. He just kept saying, "but I just finished it all yesterday..." There was nothing to say to make it any better...but who ever would have thought...hail.